mall’s Hotel, on a little isle off Long Island, is where Peter Leroy and his wife, Albertine, have spent most of their adult lives. Albertine is the innkeeper, while Peter works quietly on his memoirs. But as Peter nears the age of fifty, guests grow harder to come by—hardly come by at all, in fact—and soon the future of the hotel, and of every gift Peter dreams of giving his wife, is in jeopardy. What he does to save his marriage (and perhaps his life) is the story of this book. It involves storytelling, friendship, childhood, memory, ghostwriting, real-estate agents, electric contraptions, and great, abiding love. With Leaving Small's Hotel, his first hardcover in two years, Eric Kraft has written his warmest and most moving novel since Herb ’n’Lorna: an embraceable, human story, and the perfect introduction to one of our most gifted and inventive writers. An endearing history of ex-urban American life that consistently evokes Mark Twain, James Thurber, and their kindred. The result is a compact comic Decameron, a deadpan fantasia . . . a minor masterpiece: one of the most delightful novels of the decade. Is there a more beguiling writer today than Eric Kraft? In his latest comic novel, he manages to combine two of his work’s hitherto disparate modes—the pastoral (à la Wodehouse) and the black humor that runs like a stain through American literature from Melville to Nathanael West—to hilarious effect. . . . With his customary elegance, Kraft has written a coda to the utopian impulses that lurk in the heart of our century; this novel will please both fans and readers new to the small, welcoming hotel of the Peter Leroy books. Leaving Small’s Hotel is edgier than most of Kraft’s work . . . The book is imaginative, clever, and convoluted, offering a twist in the road Kraft has been building to our collective past. Under the surface humor, Kraft’s take on the national experience is thoughtful, disturbing, and unlike that of any other American writer. With Kraft’s typical skill, erudition and levity, it broaches the very nature of the human condition through its winning anecdotes of Leroy’s present, and of his remembered and embroidered past. . . . Kraft’s imagination, like Leroy’s, is endlessly fertile, not merely in its creations but in its connections, as well, so that each apparently innocent anecdote chimes with Kraft’s broader theme of the imagined life, of its thrilling, enhancing, and ultimately dangerous connection to the real. . . . But the novel ends on a note of joyous possibility, offering both Leroy and his brilliant creator the freedom to create something new. Kraft doesn’t have the wide audience he merits. . . . Even geniuses are shortchanged of the attention they deserve—and it doesn’t feel like exaggeration to call Kraft a genius on the basis of his finest books: Little Follies, Where Do You Stop? and At Home with the Glynns. There is a delightful loopiness to the novels of Eric Kraft that no other writer today can emulate. It is a sly charm that makes us think his stories are a good deal simpler than they are. In fact, they are wonderfully complex, multi-layered and multileveled, as carefully painted as Japanese miniatures. There is also a good deal of raw emotion hiding just beneath the charming surface, more in this book than any of its several predecessors. The belief has long been held here that Eric Kraft is one of our best writers, and Leaving Small’s Hotel reinforces it. . . . Not since James Thurber has anyone written so delightfully about the foibles of his childhood. From a mid-life crisis of failed dreams and an uncertain future, Eric Kraft weaves a beguiling, affectionate comedy of love and possibilities. Eric Kraft is a writer of episodes adding up to enigmas that revolve around the continuing “Personal History, Adventures, Experiences & Observations” of one Peter Leroy. . . . The result is a series of warm, engaging vignettes—gentle speculations on the way the imagination works and memory distorts, and on the way we build and manipulate our personal mythologies. The wonder of these inventions is that they never seem ponderous or dense, despite the critical mass such author-character relationships usually precipitate. Here the implications are merely suggested and then left for readers to consider or pass over. . . . Everything in the novel is implication; nothing is certain. In the end, one story is all stories and all stories are one story, so no single narrative counts for more than any other. It’s a tribute to the author—whoever the author might be—that this strange state of affairs winds up seeming just right. A wonderful matryoshka of a novel, with at least five stories nested one inside the other . . . the various tales move toward contrasting climaxes with just the sort of spectacular intricacy that makes a business fail and a novel fly. Kraft . . . has created a beguiling tale of hope, friendship, memories, and love. Recommended for all fiction collections. The latest installment (after At Home with the Glynns, 1995) in the ongoing chronicles of Peter Leroy (whose early volumes were published separately in the 1980s, then collected in Little Follies, 1992). Peter—Kraft’s admitted alter ego (as a disarmingly metafictional “Preface” and “Afterword” make clear, “We are not the same person, though we share a mind”)—has now reached middle age, and both career and midlife crises: His marriage is showing its age, and the small hotel (“Small’s”) that he and his wife Albertine run on an island near his hometown (Babbington, Long Island) is failing and may not be easy to unload. A plan is hatched: Like a very Scheherazade, Peter will offer readings from his ongoing memoirs (entitled Dead Air) to guests, a chapter a night for 50 nights, ending on the occasion of his 50th birthday. The stories Peter tells—deftly interwoven with the story of his and Albertine’s rueful compromises with the facts of time and change—make up an endearing history of ex-urban American life that consistently evokes Mark Twain, James Thurber, and their kindred. The result is a compact comic Decameron, a deadpan fantasia woven around several important, not to say obsessive, present concerns (mainly, courting realtors and potential buyers) and memories (young Peter’s preadolescent crush on a schoolmate’s mother; mock-Tom-Swiftian misadventures with photography, radio transmission, and a flying-saucer detector; and his interrupted progress on a detective novel, Murder While You Wait, are especially choice). And if that weren’t enough Kraft/Leroy has (have?) a positive genius for chapter titles (“Bivalves from Outer Space,” “Artificial Insinuation”) and attention-getting understatements (“I decided to believe in flying saucers after seeing five of them and a naked woman while I was carrying the garbage cans out”). Add in an unsentimental and perfectly convincing portrayal of a happy marriage, and you have the recipe for a minor masterpiece: one of the most delightful novels of the decade. Is there a more beguiling writer today than Eric Kraft? In his latest comic novel, he manages to combine two of his work’s hitherto disparate modes—the pastoral (à la Wodehouse) and the black humor that runs like a stain through American literature from Melville to Nathanael West—to hilarious effect. As members of Kraft’s loyal cult following already know, Kraft’s alter-ego, Peter Leroy, and his (Peter’s) wife, Albertine, run a hotel on Small’s Island, off the fictional Long Island town of Babbington. In the current installment, Peter’s turning 50, the hotel’s failing, and Albertine is at her wits’end trying to hold their lives together. The book’s events are strung out over 50 days during which Peter reads passages from his memoirs to the hotel guests after dinner. By this dexterous device, Kraft (Herb ’n’ Lorna) manages to introduce a teeming cast of characters and to juxtapose Peter’s current anxieties to a lifetime of ups and downs. As Peter decides to sell the place, Kraft keeps his focus on the couple and on the question, which torments Peter, of whether in fact Albertine hasn’t paid for his otherworldliness with her own sweat and tears. With his customary elegance, Kraft has written a coda to the utopian impulses that lurk in the heart of our century; this novel will please both fans and readers new to the small, welcoming hotel of the Peter Leroy books. Eric Kraft’s essential subject is suburban boyhood—in particular, that moment when it loses its innocence. This spring, Picador USA will publish his new novel, Leaving Small’s Hotel ($23). Like Lawrence Sterne, Kraft is unashamedly sentimental, digressive, and extremely funny; like Proust, profoundly nostalgic and obsessed with loss. The typical Kraft novel is a laugh-out-loud read with undertones of grief and ruefulness. Almost all of his books revolve around a single individual, Peter Leroy, who is now—after six previous novels, also released in paperback by Picador—as fully realized as any character in current American literature. Leaving Small’s Hotel is edgier than most of Kraft’s work. Leroy has reached 50, having failed at just about everything he’s tried. He and his wife, Albertine, are deep in debt. He spends his time listening to a seemingly insane black humorist named Bob and his dummy, Baldy, on the radio. The book is imaginative, clever, and convoluted, offering a twist in the road Kraft has been building to our collective past. Under the surface humor, Kraft’s take on the national experience is thoughtful, disturbing, and unlike that of any other American writer. Over the course of five novels and nine novellas, Eric Kraft has created a thoroughly convincing, if comically askew, alternate reality centered around the fictional Long Island town of Babbington and the memories of his literary alter ego, Peter Leroy. An obsessive and self-admitedly unreliable (even willfully fraudulent) autobiographer, Leroy narrates imaginary stories about his childhood with an unlikely and entirely successful mix of wistfulness and humor. By repeatedly alerting readers that what they have before them is a fabrication, Kraft explores how fiction can so powerfully transform—and yet so effectively convey—truth. In Leaving Small’s Hotel, his latest Peter Leroy novel, Kraft turns his metafictional musings toward the question of why the writer feels compelled to imagine other lives and other worlds. To mark his 50th birthday, Leroy elects to read one chapter of his new autobiographical work, Dead Air, each night for 50 nights in the lounge of the hotel he and his wife Albertine own and operate on an island in Babbington’s harbor. Small’s Hotel (“The Little Hotel Without a Slogan”) has fallen on hard times, and Albertine hopes a unique literary event will attract paying guests. Much to Leroy’s surprise, curious tourists do appear, including one—Cedric “Call Me Lou” Abbot—who decides to stay for all 50 nights. In several ways, Leaving Small’s Hotel is a departure for Kraft. Daed Air—the book-within-the-book—has an uncharacteristically downbeat ending. At the same time, Kraft provides more details about the adult Leroy’s life than usual, particularly about his marriage to Albertine and their financial troubles. These “present-day” sections are punctuated by misplaced and deliberately unpleasant outbursts of anger directed by a mysterious radio-talk-show host at the depth of human misery and depravity. And in the novel's clever preface, Leroy acknowledges the existence (albeit imaginary) of one Eric Kraft—“a useful fiction,” he tells us—and laughs at Kraft’s fanciful belief that Leroy is the literary avatar rather than the other way around. Kraft makes an appearance at novel’s end as well, walking along a beach and rewriting the book’s last lines. In between, the adult Leroy wrestles with the life he has chosen as a writer (even as his childhood self learns the consequences of his actions). In Leaving Small’s Hotel, the latest in the chronicles of Peter Leroy, Peter is approaching 50, the island hotel he and his wife, Albertine, run is failing, and his publishers have just canceled his children’s series, calling it irrelevant to the times. To Albertine’s relief, Peter agrees to sell the place, although it may not be easy to find a buyer for a crumbling albatross with a leaky roof, a dangerous boiler, and few guests. Especially since their sensibilities balk at prospects who want to tear the old place down and build a theme park or a survivalist’s camp. The story takes place over 50 days as Peter, in hopes of attracting guests, advertises a plan to read a chapter a night from his childhood memoirs, Dead Air (the term for inadvertent radio silences), ending on his birthday. Past and present mingle as the guests, caught up in the hilarious Tom Swiftian adventures of 13-year-old Peter, become immersed in the hotel itself and the plight of their hosts. Peter’s memoir vignettes, Scheherazade-like, are a marvelous distraction from the mundane cares of the present. Peter evokes the suburban childhood of the early ’60s build-it-yourself radios and flying saucer detector kits ordered from the alluring ads of Popular Mechanics magazine, the obsession with bomb shelters, an adolescent crush on the neighborhood’s prettiest housewife. Like the hotel’s guests, readers will eagerly await each installment, each a self-contained gem. Kraft’s background characters are quirky and comedic and a strong strain of humor—black, wacky, and self-deprecating—runs through everything, even Peter’s mostly fictional toying with murder and suicide. Playing with the boundaries of imagination and perception in life as well as fiction, Kraft invites the reader to participate in his story. Providing the continuity of background lip—the boy’s ambition and the man’s disillusion—is the late-night radio character Baldy. A ventriloquist’s dummy (on radio! ), Baldy’s disgruntled musings dwell on how very much worse the listener’s life could be. Leaving Small’s Hotel is a story that will delight fans of Kraft and Peter and please newcomers with the awareness that there are earlier chronicles to discover. There is a delightful loopiness to the novels of Eric Kraft that no other writer today can emulate. It is a sly charm that makes us think his stories are a good deal simpler than they are. In fact, they are wonderfully complex, multi-layered and multileveled, as carefully painted as Japanese miniatures. There is also a good deal of raw emotion hiding just beneath the charming surface, more in this book than any of its several predecessors. The belief has long been held here that Eric Kraft is one of our best writers, and Leaving Small’s Hotel reinforces it. Once again, Kraft’s central character is Peter Leroy, a writer turned innkeeper who was created by Kraft for a series of radio scripts and kept by him when he turned to hardcover fiction. This is Kraft’s seventh novel, and most of them deal either with Peter Leroy, Peter Leroy’s relatives, or Peter Leroy’s creations. It started with Herb ’n’Lorna and moved forwards, backwards, and sideways. My favorite until now has been Reservations Recommended, in which melodrama is built around recipes, but that’s kind of hard to explain. In fact, most of Eric Kraft’s writing is quite hard to explain. Like Kraft, Leroy is a writer. What Leroy likes to write about is his early life. He prepares a series of short recollections of the events of his childhood and peoples them with a most interesting group of characters. We tell ourselves that growing up in the fictional town of Babbington, Long Island, must have been exciting. But we are wrong. The characters are exciting enough but they are not real. Leroy made them up, sometimes improvising on events he witnessed. There’s more. There are two Peter Leroys; that is, one Peter Leroy with two faces. The second face is that of an innkeeper on an island that sounds something like Shelter Island, which is near East Hampton, where Kraft lives. Leroy is trying to make a living, a tough proposition because the hotel eats up the little money he makes by his writing. One more thing—there is a character named Eric Kraft in Peter Leroy’s writing, another writer, also struggling, although whether he bears a resemblance to the real Eric Kraft is uncertain. While the construction of the novel is complex, its effect is simple. It is about nine parts mockery to one part sentiment, a blend that works quite well, reaffirming Rochefoucauld’s maxim that one mocks what one loves. Meanwhile, in each chapter, there is another story, a less happy one, about Leroy’s attempt to save his hotel. In this, he is aided by one of his guests, Cedric R. Abbot, known as Lou, who performs some much-needed repairs and pays for them out of his own pocket. It doesn’t much matter. With each patron, Leroy loses more and more money, and it is only a matter of time before he’ll have to abandon the hotel. Not since James Thurber has anyone written so delightfully about the foibles of his childhood. Since 1982, author Eric Kraft has been constructing one of the more unlikely edifices in American fiction: a serial novel delightfully homespun yet wildly convoluted in structure and intricately laced with literary allusion and homage. Up to now, The Personal History, Adventures, Experiences & Observations of Peter Leroy (as the series is collectively titled) has been gently satiric in tone, although not without its shadowy undercurrents. Kraft’s hero and alter-ego, Peter Leroy—a native of Babbington, Long Island, “Clam Capital of America”—lingers in an eternally golden boyhood from book to book. While reference is made in each novel’s preface to Small’s Hotel, where the grown-up Peter and his wife Albertine live, the foremost image of Peter in the reader’s mind has been of an eccentric 11- or 12-year-old more caught up in clam lore or home projects inspired by his favorite magazine, Impractical Craftsman, than in the workaday troubles of the world. Albertine’s take on their plight is even more bleak: “Costs are rising. Income is falling. We have been making up the difference by borrowing. We cannot borrow any more. Our ship has not come in.” She’s tired of her isolated existence—Small’s Hotel is located on an island off Babbington—and she yearns for a new life in Manhattan. The question is: Will anyone buy them out of their financial mess so they can start over? The attempt to answer that question supplies much of the book’s narrative impulse. Kraft being Kraft, though, complications of tone, technique and typeface set in almost from the very first page, and at least half a dozen discrete story lines vie for attention. They include (1) Dead Air, a memoir in fifty self-contained episodes, to be read aloud nightly by Peter as a kind of farewell to the hotel’s clientele; (2) “Baldy's Nightcap,” a radio program Peter listens to, in which a marionette named Baldy adds new nightly entries to his grisly “Catalog of Human Misery” (his way of telling listeners they're better off than they know); (3) Murder While You Wait, Peter’s attempt at a new, more commercially viable adventure series, in which hit-man protagonist Rockwell Kingman takes a mass-slaughter approach to his profession; (4) Albertine’s diary, which Peter writes; (5) and various cameo narratives by regulars from earlier Peter Leroy books. By contrast, “Buddy's Nightcap” is genuinely creepy, Albertine’s diary genuinely dispiriting and Murder While You Wait a cheaply scattershot gorefest. Indeed, the autumnal despair closing in on Peter is almost overwhelming, and relief doesn’t appear on the horizon until well past the novel’s midpoint. This wouldn’t be a problem if the whole package didn’t feel so unwieldy. There are wonderful passages here—among them a moment when nostalgia-prone Peter grows uncomfortably aware that his boyhood atomic anxieties are “taking on the rosy glow of remembered pleasures”—but also flaws. Some of those fleeting appearances by earlier Leroy characters feel like extra baggage and won’t mean much to those new to Kraft, while the arrival of Albertine’s and Peter’s savior—obvious to the reader long before the beleaguered couple notice it—seems a little too convenient to be convincing, even as whimsy. As for the asides on “the death of the culture, the literate culture,” these feel worryingly like sour grapes. In the book’s preface and closing chapter, the close link between Kraft and his Peter Leroy persona is spelled out, and a reference to Kraft and his wife Madeline as “heavily in debt” and “sinking into the cesspool of popular culture” drives home the parallel. Kraft doesn’t have the wide audience he merits. Nor do dozens of other writers in an age so rich with fiction talent there’s no way of keeping track of it all. Even geniuses are shortchanged of the attention they deserve—and it doesn’t feel like exaggeration to call Kraft a genius on the basis of his finest books: Little Follies, Where Do You Stop? and At Home with the Glynns. These remain the best introduction to him. Leaving Small’s Hotel is better left to Kraft completists, who know his past accomplishments and will wonder, with him, why they haven't made him more of a household name. Previously, readers watched Peter’s grandfather and grandmother corner the market in exquisitely worked mobile pornographic miniatures, witnessed Peter’s adolescent sexual trysts with the nubile Glynn twins, and followed other surreal histories he has concocted about the town of Babbington—and his friends, neighbors, family members, and (most of all) himself. All through these funny, deftly structured adventures and asides, readers have tried to fathom Peter’s peculiar relationship with his creator. This sounds a little precious, and sometimes it reads that way, yet the result is a series of warm, engaging vignettes—gentle speculations on the way the imagination works and memory distorts, and on the way we build and manipulate our personal mythologies. The wonder of these inventions is that they never seem ponderous or dense, despite the critical mass such author-character relationships usually precipitate. Here the implications are merely suggested and then left for readers to consider or pass over. In this latest installment, Leaving Small’s Hotel, Peter has fallen on hard times. Along with his beloved and extremely long-suffering wife, Albertine, he has reached the end of the line, running a broken-down establishment on a modest island off Babbington. While he constructs (or reconstructs or deconstructs) his memoirs upstairs, she manages the place and keeps the books, which reveal a deep slide into debt. But this is only one of the novel’s narratives within narratives. There are, in fact, so many, and they’re all given such similar weight, that it’s impossible to figure out which is the most important. Is it Peter’s nightly reading of Dead Air, a multipart distortion of his childhood—with morsels like young Peter’s marketing of a flying saucer/nuclear warhead detector (which soothes the tormented by never going off) and his construction of a cave, an activity that teaches “the art of self-deception”? And within this story is the tale of Mrs. Jerrold, from “just around the corner or across the street or down the block,” who mixes memory and desire in a particularly combustible way. Is hers the central narrative? Maybe we should concentrate on the mysterious Lou and his many friends. He comes for a reading and stays forever, solving problems while remaining a riddle. Or is it the cynical Baldy, the ventriloquist’s dummy on the radio who seems to offer a running commentary on events at the hotel? As Lou points out, “It’s the ventriloquist who controls the dummy, and not the other way around”—but in Leaving Small’s Hotel it’s not always possible to tell which is which. Everything in the novel is implication; nothing is certain. In the end, one story is all stories and all stories are one story, so no single narrative counts for more than any other. It’s a tribute to the author—whoever the author might be—that this strange state of affairs winds up seeming just right. Peter Leroy and his wife, Albertine, run a small hotel on an island near Babbington, Long Island. Peter, nearing age fifty, is reflecting on his life. The hotel business isn’t doing so well; there’s been a decrease in guests, and there isn’t enough money to fix the leaky roof or mend the cistern. Peter worries about his wife’s happiness, about getting older, and about his future. Albertine, who runs the hotel, creates an advertisement about Peter reading from his memoirs—one entry a day—leading up to his fiftieth birthday in the hopes of enticing more paying guests. Through the daily memoirs, we begin to hear stories about thirteen-year-old Peter and his friends. Peter talks about his crush on a neighbor woman and about his adult friend Porky White, owner of the Kap’n Klam restaurants. Past and present intermingle as we learn about the boy who became Peter Leroy. Kraft, who has written several other books about Peter (Little Follies, St. Martin’s, 1995), has created a beguiling tale of hope, friendship, memories, and love. Recommended for all fiction collections. Fans of Eric Kraft’s fiction will need no introduction to its protagonist, Peter Leroy, nor will they require explanations of his fictional Long Island home, Small’s Hotel on Small’s Island, opposite his native Babbington. All Kraft’s devoted readership needs to know is that the latest installment in Leroy’s “Personal History, Adventures, Experiences and Observations” is available in bookstores, that it is vintage Leroy, or vintage Kraft, and that, with Kraft’s typical skill, erudition and levity, it broaches the very nature of the human condition through its winning anecdotes of Leroy’s present, and of his remembered and embroidered past. . . .
Leroy’s early adolescence provides a doubling narrative to the bleaker contemporary scene. . . . The boy’s Babbington, in an era of Cold War anxiety, is full of resourceful optimism and humor, peopled by generous and gentle characters. But just as the disaster in present-day Small’s Hotel proves less dire than it seems, so, too, Peter’s youthful idyll is not purely benign: Happy endings come where least expected and fail to materialize where they are taken for granted. In addition to these overflowing worlds of now and then, the novel bursts with epigraphs galore, citations from Schlegel, Proust, Cervantes, Goethe, and Thackeray, to name a few, which resonate outward from Peter Leroy’s humble life and link it to the universal. The book is also wittily interspersed with diagrams and advertisements, with the busy stuff of “real” life. Kraft’s imagination, like Leroy’s, is endlessly fertile, not merely in its creations but in its connections, as well, so that each apparently innocent anecdote chimes with Kraft’s broader theme of the imagined life, of its thrilling, enhancing, and ultimately dangerous connection to the real. There is also much sorrow in Leaving Small’s Hotel, as its title suggests, and an uncomfortable acknowledgment of the potentially imprisoning consequences of imaginative escape. But the novel ends on a note of joyous possibility, offering both Leroy and his brilliant creator the freedom to create something new. A wonderful matryoshka of a novel, with at least five stories nested one inside the other: novel, satire, memoir, radio play, murder mystery. In the central tale, Peter Leroy, assistant innkeeper, treats his guests to nightly readings about his crackpot boyhood business ventures (the Magnetomic Flying-Saucer Detector!). As he and his wife, Albertine, desperately try to unload this albatross of a property, the various tales move toward contrasting climaxes with just the sort of spectacular intricacy that makes a business fail and a novel fly. Leaving Small’s Hotel is published in paperback by Picador, a division of St. Martin's Press, at $14.00. You can order it on the Web from Amazon.com Books. Leaving Small’s Hotel is a work of fiction. The characters, incidents, dialogues, settings, and businesses portrayed in it are products of the author's imagination and are not to be construed as real. Any resemblance to actual events or persons, living or dead, is entirely coincidental. 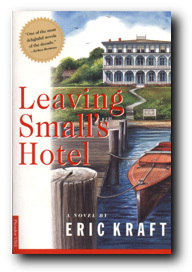 Leaving Small’s Hotel was first published on May 11, 1998, by Picador USA, a division of St. Martin’s Press, 175 Fifth Avenue, New York, New York 10010. For information about publication rights outside the U. S. A., audio rights, serial rights, screen rights, and so on, contact Candi Lee Manning at Manning & Rafter Advertising, Promotion, Public Relations & Used Cars.